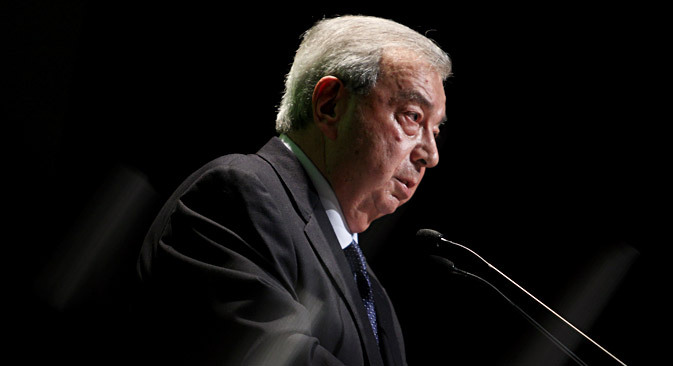 Yevgeny Primakov, Russia’s Minister of Foreign Affairs from 1996-1998 and prime minister of the Russian Federation from 1998-1999, died on June 26 in Moscow after a long illness, a source close to the politician told news agency Interfax. Primakov’s death was confirmed by his grandson Yevgeny Sandro. He was 85. Peskov added that Putin considered Primakov a “comrade-in-arms.” “He was a statesman, scholar and politician; he has left a great legacy,” Peskov added. Many prominent Russian political figures also expressed their sadness at the loss. According to Khakamada, Primakov brought a wide range of skills to his political life. An experienced intelligence officer, he was also a diplomat who knew how to negotiate. He was “always interested in the economy and always knew where the pressure points were,” Khakamada said. Mikhail Delyagin, a former aide to Primakov, also noted the politician’s skill in coping with economic crises. “He headed the government following the catastrophic 1998 default and saved Russia in the truest sense of the word,” Delyagin said. Gennady Semigin, another former deputy speaker of the State Duma who worked with Primakov, also expressed his condolences in an interview with RBTH. “Yevgeny Maximovich was one of the most decent, honest, highly qualified leaders of the country. He did much to develop the country. He was a true patriot of Russia,” Semigin said. The State Duma honored Primakov’s memory with a minute of silence, and current Duma Deputy Speaker Nikolai Levichev proposed that a monument to Primakov be erected on Lubyanka Square in central Moscow. Primakov, who trained as an Arabic scholar, headed the Institute of Oriengtal Studies of the Soviet Union from 1977 to 1985. He later became chairman of the Supreme Soviet of the Soviet Union, and from 1991 to 1996, he served as director of the Foreign Intelligence Service of Russia. In 1999, while serving in the position of prime minister, he made the decision to cancel a visit to the United States and ordered his plane to turn around over the Atlantic in protest of the NATO bombing of Yugoslavia. The incident became known as Primakov’s loop. The move was a literal turning point in U.S.-Russian relations, and was later characterized as the beginning of Russia’s foreign policy focus on the creation of a multi-polar world at the expense of improving the country’s relations with the West. After his time as prime minister, Primakov spent a year in the State Duma and served as president of the Russian Chamber of Commerce and Industry from 2001-2011. He is survived by his wife, daughter and several grandchildren.